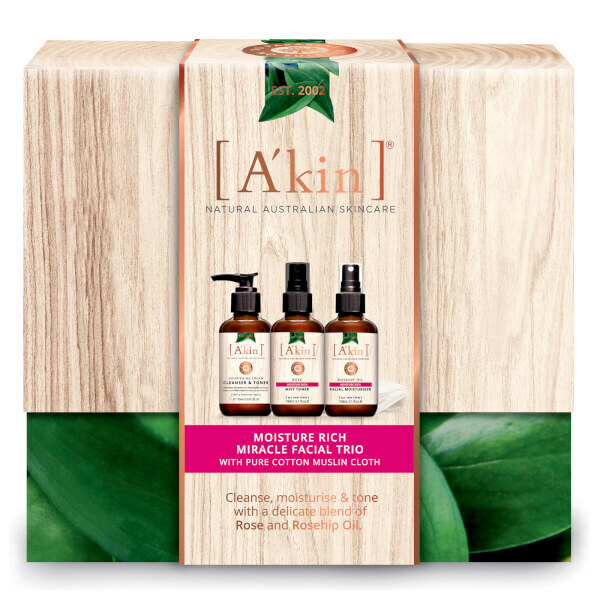 Treat your complexion to A'kin Moisture Rich Miracle Facial Trio; a skincare collection to cleanse, tone and moisturise. Complete with a pure cotton muslin cloth. A cream cleanser perfect for dry, sensitive skin. Enriched with Rose, Geranium and Shea Butter, the luxurious formula gently eliminates makeup and impurities, without over-drying or uncomfortable tightness. A dose of Witch Hazel tones and refreshes to leave skin feeling rebalanced. Infused with aromatic Rose Essence and soothing Aloe Vera, the weightless formula absorbs quickly into skin to instantly soothe and refresh, without greasy or sticky residue. Suitable for all skin types, especially normal to dry, the rejuvenating toner can be stored in the fridge for an intensely revitalising spritz after a busy day. A deeply hydrating formula enriched with three certified organic oils and butters to replenish and restore. Lightweight and quick-absorbing, the non-greasy moisturiser softens and conditions skin, whilst Aloe Vera Extract soothes and rejuvenates. Cleanser & Toner: Massage onto face and neck morning and night. Tissue off or rinse with warm water. Moisturiser: After cleansing, gently massage into face, neck and décolletage. Cleanser & Toner: Water (Aqua), Glycerin*, Caprylic/Capric Triglyceride*, Sesamum Indicum (Sesame) Seed Oil*, Cetearyl Alcohol*, Sorbitol*#, Sodium Stearoyl Lactylate*, Glyceryl Stearate*, Lecithin*#, Squalane*, Butyrospermum Parkii (Shea) Butter*+, Persea Gratissima (Avocado) Oil*+, Macadamia Ternifolia Seed Oil*, Hamamelis Virginiana (Witch Hazel) Water*, Sodium Isostearoyl Lactylate*, Stearic Acid*, Phenoxyethanol, Glyceryl Laurate*, Xanthan Gum*, Sodium Hydroxymethylglycinate, Rosa Centifolia (Rose) Flower Water*, Panthenol (Provit. B5), Simmondsia Chinensis (Jojoba) Seed Oil*, Ethylhexylglycerin, Sodium Gluconate*#, Pelargonium Graveolens (Geranium) Flower Oil*, Tocopherol (Vit. E), Fusanus Spicatus (Sandalwood) Wood Oil*, Ascorbyl Palmitate*, Hydrogenated Palm Glycerides Citrate*, Benzoic acid, Citronellol^, Farnesol^, Geraniol^, Linalool^. +Certified organic, *From Botanical source, ^From Essential Oil, #GMO Free. Toner: Rosa Centifolia Flower Water*, Aloe Barbadensis Leaf Juice+, Aqua (Water), Macadamia Ternifolia Seed Oil*, Polyglyceryl-10 Laurate*, Sorbitol*, Heptyl Glucoside*, Sodium Gluconate*, Sodium Levulinate*, Ethylhexylglycerin, Potassium Sorbate, Citric Acid*. +Certified Organic, *From Botanical Source. Moisturiser: Aloe Barbadensis Leaf Juice+, Rosa Centifolia (Rose) Flower Water, Macadamia Ternifolia Seed Oil*, Cetearyl Olivate*, Butyrospermum Parkii (Shea) Butter+, Sorbitan Olivate, Glycerin*, Rosa Canina (Rosehip) Seed Extract+#, Sorbitol*, Persea Gratissima (Avocado) Oil+, Cetearyl Alcohol*, Xanthan Gum*, Sodium Gluconate, Tocopheryl Acetate (Vit E)*, Pelargonium Graveolens (Geranium) Flower Oil, Rosmarinus Officinalis (Rosemary) Leaf Extract+, Fusanus Spicatus (Sandalwood) Wood Oil, Helianthus Annuus (Sunflower) Seed Oil*, Citric Acid, Lecithin*, Phenoxyethanol, Sodium Dehydroacetate, Linalool^, Citronellol^, Geraniol^, Farnesol^. +Certified organic, *From Botanical source, ^From Essential Oil, #GMO Free.